Richard Bailey has earned the BS, MEd, MA, and PhD degrees. A fellowship made it possible for him to travel and study in Europe and Africa. 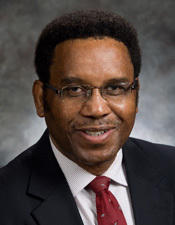 Since returning to Montgomery, Dr. Bailey has been a consultant for the Center for Public Television at The University of Alabama, where he was a consultant for their productions on the Lincoln School of Marion and Reconstruction black officeholders. For the Division of Telecommunication and Educational Television at Auburn University, Bailey was an advisor for the Gees Bend story and the Horace King documentary. He was a consultant for the award-winning radio documentary, “Remembering Slavery,” produced by the Institute for Language and Culture at the University of Montevallo. In the mid-1980s Gov. George C. Wallace appointed him twice to the De Soto Commission to reconstruct the path of the Spanish explorer through Alabama. Kiosks along select Alabama highways identify the route of De Soto. On February 9, 2012, Dr Bailey was interviewed on WSFA Newsmakers in Montgomery, Alabama. Video is no longer available online. Go to WSFA to search for the video. to your group, club, family reunion, or church? (please plan 4-6 weeks advance notice of event). Contact him now at [email protected].. Please include the activity, location, and date of the activity that you would like to have Dr. Bailey attend.